I got some free stuff from Vitalicious a little while ago, and since I couldn’t possibly eat them all, I froze them. One of the flavors I froze and then did a quick heat-up in the microwave was the BlueBran flavor. When I opened it up, I thought it resembled the Cran Bran flavor I had tried (and loved!) in the past, except with blueberries. The stats were impressive. 1 BlueBran VitaTop was 100 calories, with 5 grams of fiber and only 9 grams of sugar. I took a bite, and thought it was pretty good. It was mildly sweet, with a pretty good amount of blueberries embedded in the VitaTop. It was chewy, a bit “grainy”, and had a whole wheat flavor. Also, it was kind of like the Cran Bran flavor, but with blueberries, just as I had suspected. Overall, 3 1/2 stars. I can picture this to be quite tasty with a Blueberry Chobani Yogurt, or even a glass of milk. Mmm! 1 VitaTop is 100 calories, 1 gram of fat, 20 grams of carbohydrates, 5 grams of fiber, 9 grams of sugar and 4 grams of protein. Have you ever had a Vita Top? What’s your favorite flavor? 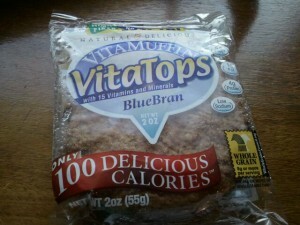 Well, today’s review is the Raisin Bran VitaTop from Vitalicious. I happen to like a few of the Vitalicious products that I already reviewed, including one of my favorites the Cran Bran VitaTop. What’s also cool about these VitaTops? They are a good source of fiber, and are only 100 calories! So I opened up my Raisin Bran VitaTop( which was in the freezer and then I defrosted it) and looked at it. It seemed as if there weren’t a lot of raisins, maybe about 5 or 6, and it had a brown color and a somewhat bumpy texture. I took a bite and was surprised in 2 ways. 1- The first bite of my VitaTop was dry. I don’t know if it was because it was in the freezer, and maybe just that part of the muffin lost some moisture, but it was dryyyyy. 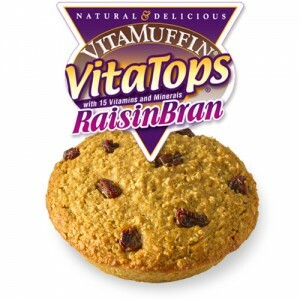 2- There were actually more raisins then I thought, scattered throughout the VitaTop and not just on top, and they were actually quite good, and quite sweet. So, I gave it a few more bites. Not as dry as the first bite, so perhaps just that part of the VitaTop was dry, and the rest wasn’t as much. It sort of had the same flavor as the Cran Bran VitaTop, which was a toasted flavor and a bumpy texture. The raisins added a nice touch with some sweetness, and overall the VitaTop was kind of chewy. Overall, 3 1/2 stars. Not my favorite VitaTop, but still pretty good. I love that it has 5 grams of fiber and 100 calories as well! 1 VitaTop is 100 calories, 1 gram of fat, 22 grams of carbohydrates, 5 grams of fiber, 11 grams of sugar and 4 grams of protein. The generous folks at Vitalicious (thanks, Frank!) sent me a HUGE sampler pack of vitatops, so I figured I would break it up in a few posts rather than all at once. These muffin tops are all natural, have 5-6 grams of fiber, are fortified with vitamins & minerals, made with whole wheat flour, and have very little fat. The Vitatop, according to the website, is a ” “one-hand” satisfying snack food with the portability of an energy or granola bar, is easy to eat anywhere, anytime”. They also come in a bunch of varieties, satisfying almost everyones palate. The Chocolate Varities of the VitaTops come in Fudgy Peanut Butter Chip, Deep Chocolate, Chocolate Mint, Banana Fudge, Triple Chocolate Chunk, Double Chocolate Dream, Dark Chocolate Pomegranate, and Sugar Free Velvety Chocolate. I was sent a variety of flavors to try, including the Fudgy Peanut Butter Chip, Deep Chocolate, and Triple Chocolate Chunk (sooooo. EXCITED.) Let’s dig in! Fudgy Peanut Butter Chip- yummmm. When does peanut butter and chocolate let me down? There are decent sized peanut butter chips on top of a chocolatey, cake like muffin top. The chocolate muffin part had a nice chocolate flavor, not too sweet, and was just a tad bit dry. However, nothing a glass of milk couldn’t solve 🙂 . My only complaint was that my muffin top only had 3 peanut butter chips on top. I want more peanut butter !! Triple Chocolate Chunk- yum! Think of the Deep Chocolate flavor- but better! A generous sprinkling of milk, white and dark chocolate chips on top of the chocolate muffin. My favorite was the white chocolate chip, sweet and savory. This was my favorite of the 3, and the sweetest. Overall, I give these 4 stars. They were a bit dry, and had more of a cake consistency than a crumbly home-made muffin. I found that microwaving them for a few seconds gave them a more decadent consistency. However, they kicked my hunger cravings to the curb, with a small price to pay of only 100 calories. They are also pretty big, at 2 oz each, and about the size of a CD. Plus, the added benefit of no artificial ingredients or sweeteners, 5-6 grams of fiber and added nutrients/minerals. My favorite way to eat them was smeared with a bunch of peanut butter (AMAZING WITH PEANUT BUTTER!). Here’s the ingredients for the Deep Chocolate flavor. For the others, along with nutritional information, visit the site. Water, whole wheat flour, organic sugar, egg whites, chocolate chips (sugar, chocolate liquor, cocoa butter, soy lecithin added as an emulsifier and vanilla), cocoa (processed with alkali), soy fiber, erythritol, inulin, dried honey, wheat gluten, leavening (sodium acid pyrophosphate, potassium bicarbonate),fruitrim (grapejuice, brown rice syrup), tricalcium phosphate, natural flavor, sea salt, xanthan gum, vitamin A, vitamin B6, vitamin B12, vitamin C, vitamin D, vitamin E, folic acid, iron, biotin, zinc.